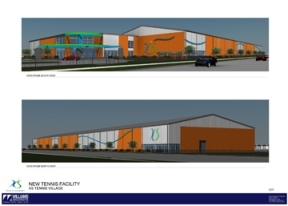 Mayor Rahm Emanuel and Chicago’s XS Tennis broke ground on a new $9.8 million, 112,000-square-foot world class tennis facility in the Washington Park neighborhood. The state-of-the-art facility will house eight indoor, a fitness center, running track, training space and classrooms. Chicago’s XS Tennis is the largest, most successful minority-owned tennis organization in the nation, serving more than 2,000 Chicago Public School (CPS) students through its free in-school Tennis XSpress program and more than 2,300 Chicago youth and residents annually.